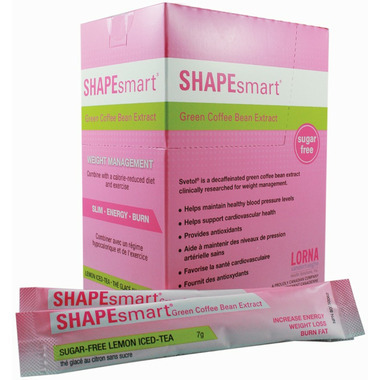 Lorna Vanderhaeghe Shapesmart is formulated with decaffeinated green coffee bean extract. Green coffee bean extract is clinically researched for weight management. Shapesmart helps maintain healthy blood pressure, supports cardiovascular health and provides antioxidants. Shapesmart does not contain artificial preservatives, colours or sweeteners; no dairy, gluten, GMOs, soy, sugar, wheat, yeast. Warnings: If you are breastfeeding, consult a health care practitioner prior to use. If you are pregnant, do not use this product. I am taking Shape Smart for the past 2 weeks but I have not noticed any change in my weight. I am 130 lbs now and so I was 2 weeks ago. I will continue taking the product for a while longer hoping that it will still shows some improvement. The taste is good and for that I gave the 3 stars. Tastes like a light lemon, iced tea drink. There is no supplement flavour to it at all, which is nice. Seems to help tone down sugar cravings and weight loss has been consistent while using it. Good product. This has doubled my weight loss each week and the taste is amazing!